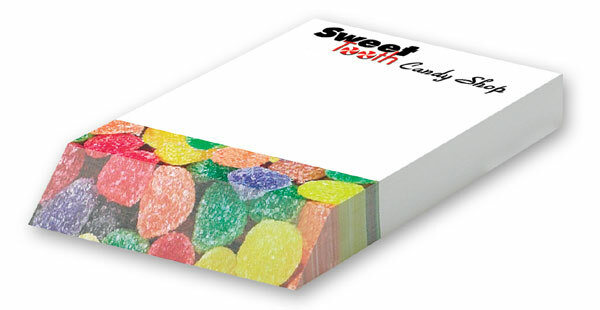 The 4" x 6" 150 Sheet Beveled Notepad adds dimension to your message from Bic. The beveled front edge allows you to see your imprint to be seen from another every angle. Bulk / 19 lbs / 42 pcs. Price includes a FREE 4-color process imprint on sheet and beveled edge. 4-color process allows you to print as many different colors as you want for one price! All PMS colors will be converted to the closest 4-color process match. A perfect match cannot be guaranteed. Beveled cuts are offered in multiple shapes at no additional charge. Stock backgrounds available, please contact customer service for more info. Imprint Area: 4" x 7/8" beveled imprint area will appear on the beveled portion of the pad.